Not a lot of filmmakers can get away with making a feature-length film about nothing. You can call Stranger Than Paradise a film about “social misfits exploring the dark side of the american dream”. At least that’s what the writer/director Jim Jarmusch said about his film on his guest appearance on The Simpsons. Though I would argue Stranger Than Paradise is about nothing. Which I would also argue is what makes the film so great. 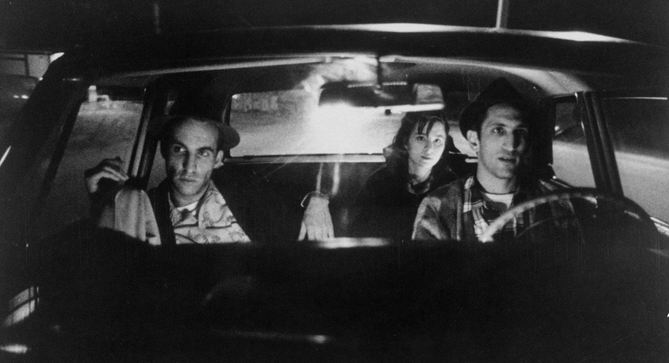 Stranger Than Paradise was Jarmusch’s second feature film after his NYU thesis Permanent Vacation in 1980. Around the same time, Jarmusch worked as an assistant to his professor/legendary director Nicholas Ray on a film called Lightning Over Water (1980). Which was about Ray’s last days before his death by terminal cancer. That film was co-directed by the equally legendary Wim Wenders who would later let Jarmusch use leftover film stock from his 1982 film The State of Things. Jarmusch used this film to make a 30-minute version of Stranger Than Paradise—the short comprising the first thirty minutes of the eventual feature film—and in 1984 we got the rest. 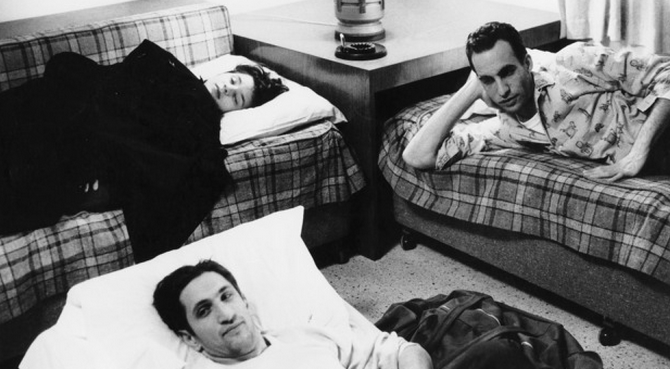 There’s not a lot to say about the setup to Stranger Than Paradise, or the middle, or the end. At least in terms of plot. It’s about people driving around, going to the movies, eating and talking. Willie (John Lure) and Eddie (Richard Edson) are a couple of card hustling slackers living in New York. In the first act, Willie’s Hungarian cousin Eva (Ester Baling) comes to visit. Do they see all the sights and sounds that New York has to offer? No. Willie and Eva hang out in Willie’s apartment talking about TV dinners and how stupid football is. That shouldn’t make for an enjoyable viewing experience, but it does. Each of these characters work because they all feel like they’ve already lived a life. They don’t feel movie characters. They aren’t overwritten or destined to follow conventional movie arcs. They are weird, silly, urban bohemians. Not the cool kind either—unless you think two guys driving to Cleveland wearing fedoras are cool. It’s a lot of little, almost invisible, touches that make Stranger Than Paradise so special. I have a lot of admiration for screenwriters that work by a less is more model. It’s tempting in a post-Tarantino world for any writer to write characters that spew self-indulgent monologues pepped full of witty one-liners and pop culture references. What I find more impressive is a writer who can pare down a conversation and scene down to its essentials while still making it interesting. One of my favorite exchanges in Stranger Than Paradise is when Willie and Eddie are leaving New York to visit Eva in Cleveland (where she lives in the second half of the film) and have this conversation with a guy on the street. Willie: Excuse me… Sir? Sir! Factory Worker: What do you want? Willie: Could you come over here a minute? Factory Worker: I’m just waiting for the bus. Willie: I want to ask you directions. Willie: Just come here, so I don’t have to yell. Can you tell me which way is Cleveland? Factory Worker: Give me a break, man. I’m just going to work. Willie: Where do you work? Factory Worker: In a factory. Willie: [Turns to Eddie] Let’s go. Eddie: [they drive off] I don’t know, Willie… Ah, the poor guy. God! You shouldn’t have given him such a hard time. Can you imagine working in a factory? Willie: No, I can’t. Now I feel bad. It’s a great example of pairing down a scene to its raw essentials. Even with so little we learn of Willie’s distaste and fear of ever becoming a regular working shlub. Not only does Jarmusch pare down the dialogue, he pares down technique. Every single scene in the movie is done with one setup, a wide, with all the action and dialogue taking place in that one setup before fading to black and moving onto the next setup. It’s almost like a series of vignettes and each shot is framed in such a dynamic and memorable fashion. I’m sure a big part of this was for cost reasons but I find it incredibly engaging. As a filmmaker it makes me want to go out and try something just like it. And that’s what the best films do. They bring out our creativity and imagination. They make us think and say things like “I’ve been in situations like that.” Or “I could do that.” This is slice-of-life filmmaking for the everyday American. Don’t be afraid by the black and white, the jazz music, the eclectic cast. This is why independent cinema exists. To communicate and relate through art. Even if that message is about nothing. Or is it everything?